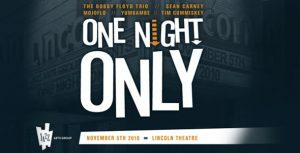 One Night Only invites you to enjoy an unprecedented musical journey, showcasing great Columbus musicians performing distinctly American styles — with jazz, blues, funk and soul filling stages throughout the historic Lincoln Theatre. Come join us for music that will move you, in a legendary Columbus venue. The entire Lincoln Theatre complex will be in full swing with Tim Cummiskey’s jazz guitar in the lobby, Yumbambe’s spicy Latin rhythms in the ballroom, and jazz standards by members of the Columbus Jazz Orchestra and Columbus Youth Jazz Orchestra in the Jazz Academy. Then, the show takes flight on the main stage when the B3 blues of The Bobby Floyd Trio meet the guitar mastery of Sean Carney. Finally, One Night Only dances into the night with a soulful ballroom after-party starring the up-and-coming funk of MojoFlo. One Night Only celebrates Columbus at its best, with good friends and great music, all to support the mission and music of Columbus’ Jazz Arts Group. Please join us for this unique evening. * 6:00 PM: Lincoln Theatre welcomes you with food, drink, silent auction, and great music. * 8:00 PM: One Night Only concert on the Lincoln’s main stage. * 9:30 PM: Dancing and desserts at the after-party in the ballroom. includes 1 admission to a pre-party festival atmosphere including heavy hors d’oeuvres from several exciting food stations; 2 drink tickets; 1 admission to main concert in Lincoln Theatre; 1 admission to after-party including dessert. includes 1 admission to main concert in Lincoln Theatre; 1 admission to after-party including dessert; 1 drink ticket. Jazz Arts Group’s One Night Only is presented by Nationwide, with additional financial support from main stage sponsor Abercrombie & Fitch; room sponsors Fifth Third Bank, Limited Brands, and Midwestern Auto Group; event sponsors Grange Insurance, Plante & Moran, State Auto Group, and Time Warner Cable; musicians sponsors Jim and JoAnne Barnes, Crabbe, Brown & James, and Siefkas Public Relations, LLC; food sponsors Dine Originals Columbus and Larry Woods Auctions; and design sponsor Fahlgren. Previous post: Jazz Violinist Zach Brock at Vonn Jazz, Monday Nov 1st..
Next post: Gene Bertoncini with Doug Richeson at Bungalow Jazz..